Three years ago I felt like a proper accomplished adult when I managed to save up enough money to buy a three seater velvet sofa. Our old one, which we d had since we bought the house, was worn and the cushions kept sliding off literally every time you sat on it. I did the usual searching forever online and ordering samples etc. and we finally settled on The Bluebell from Sofa.com. I love this sofa for its comfort and quality and am very proud of it still, so you can imagine how happy I was when sofa.com recently got in touch and asked if I would like to work with them on their recent campaign and choose a piece of furniture. I say happy, I was literally over the moon. I knew straight away I wanted a chair for my bedroom, which is my sanctuary away from the kids and the family when everyone is driving me nuts. I’ve tried to create a calming space in there with muted and neutral colours and natural textures. I had a white armchair in the corner that had seen both children through nighttime breast feeds when they were babies and although it was comfortable enough so that I often used to fall asleep in it mid feed, it had seen better days. I started looking at the chairs on the sofa.com website and new I wanted something that I could recline in and was also big enough to fill a corner space. I was immediately torn between 2 chairs, The Claude and The Penelope. Both seemed exactly what I was after although very different. They had a luxurious vibe and I loved the buttoning on them, which also gave them a classic feel. The next thing to consider was the fabric, so I went ahead and ordered lots of samples off the website. Sofa.com have a vast array of fabrics and colour ways so choosing is quite a task. I wanted a neutral colour and was undecided between linen and velvet, both of which are fabulous quality at sofa.com. When they arrived I was a little spoilt for choice so luckily managed to narrow it down to four. I needed to make a decision, so decided as I have a sofa.com store quite local to me in Bath, that I needed to go in person and see the products in the flesh. I arranged an appointment with a personal assistant Odette, who was super lovely and spent lots of time showing me around the store and picking out fabrics for me. She even pulled out an extra large fabric sample that you could drape over any chair to get a better idea. All of this was extremely helpful and I left feeling confident and went home to place my order. I was very excited but as all the products are made specially to order, there is a little wait, however a few weeks later my chair arrived. I chose The Claude in Blush Belgium Linen and I absolutely love it. Its reclined enough you can sit right back into it and relax, plus big and wide enough that it fills the corner beautifully and almost feels like a mini chaise longue. Sofa.com offer a selection of legs colour and material, so I chose English Oak turned legs without castors. The chair is one of my favourite things in the bedroom and definitely gives a classic grown up feel that I was after. The pink of the Blush Linen is just that perfect shade that is not too girly and goes perfectly with everything else in my bedroom. This is most definitely a chair I will love forever. Excitingly Sofa.com have launched their spring collection with some fabulous new products and fabrics including the stylish 360-degree swivel of their modern armchair, Monroe that taps into this year’s current trend for curves. Also they have launched a very exciting Design Lab collaboration with the amazing award winning designer Lucy Tiffney, which brings together her trademark painterly style and beautifully botanical flair. 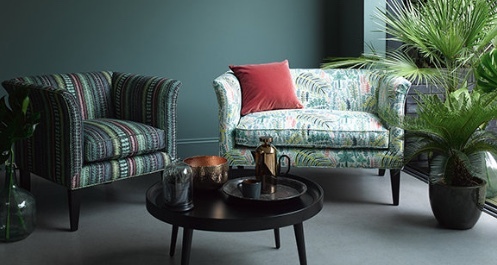 Sofa.com say “Lucy has created two exquisite upholstery fabrics and two stunning cushion fabrics for sofa.com which are on trend for a floral rich 2019, these fabrics are fresh, original and boast a decidedly one-of-a-kind quality”. I particularly love Lucy’s beautiful scatter cushions that are inspired by nature, like most of her fabulous designs. Thank you for reading and Id love to hear what you think of my beautiful new chair in its home. *This blog post was sponsored and is in collaboration with sofa.com. The chair was very kindly gifted to me, but as always all words and opinions are completely honest and are my own.